It has been a long and difficult journey, but we have persevered and conquered! ITSP is finally done! I want to thank from the bottom of my heart, my partner Joe Olson and his amazing team at Fuelcell Games (Jonathan Peters, John Scrapper, Garret Smith, Travis Phelps, Dmitri Salcedo, Troy Lawlor, Corwin Light-Williams, Chris Eng, Thomas O'Connor, Ryan Meyer, Kimberly Walker, Daniel Rosas, Bryanna Lindsay, David Heutmaker) for going above and beyond the call of duty. Five years ago, I went into this not knowing anything about how games were made. If it wasn't for their talent, guidance and expertise, this game would not exist. I also want to give props to my wife, Nancy, who not only supported me through this demanding endeavor, but she also was an instrumental part in managing Shadow Planet Productions and Gagne International throughout the whole process. Big thanks also to my friend and noise maker, Andrew Scott, who like me, went into this project with no game experience and managed to create one of the most beautiful soundscape I've ever heard. 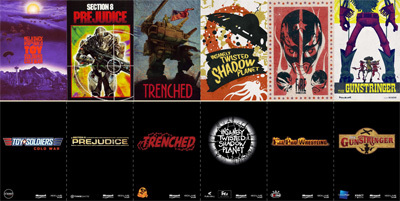 Come play ITSP and meet my partner, Joe Olson and I at Electronic Entertainment Expo (E3), June 7-9, at the Los Angeles Convention Center, South Hall – Space 1637. 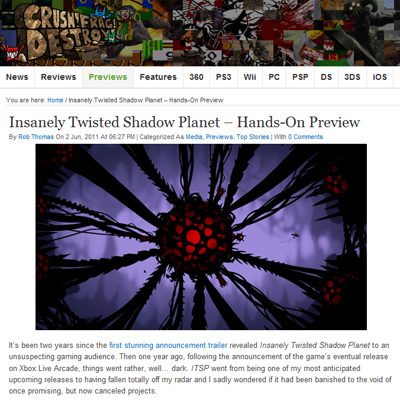 On a side note, here's a new review of our demo that was just posted at Crush!Frag!Destroy! This brings the total of reviews of our PAX demo to 22 (those are the ones we know of). 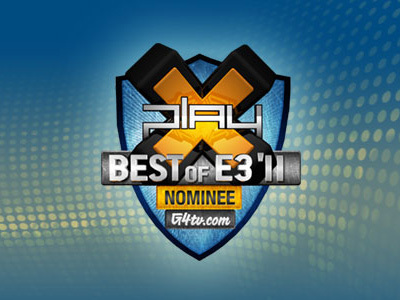 You can check out all the reviews at this link (PAX Demo Reviews). 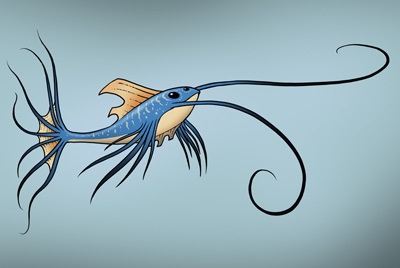 I don't do tattoo requests (so please don't ask), but in this case I had to make an exception. Meg's email was so moving and compelling, and the character she described was so vivid in my mind that I just had to find the time to do it. Once I finished it, I realized that it was the first art piece I've done this year that's not related to ITSP. Crazy! I thought you would like to see my new tattoo. 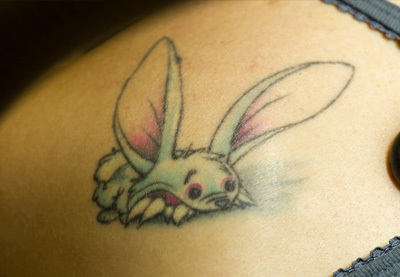 I had previously gotten a tattoo on my left shoulder of the mouse bunny from your Insanely Twisted Rabbits book, and last night I got the scorpion bunny on my right shoulder! 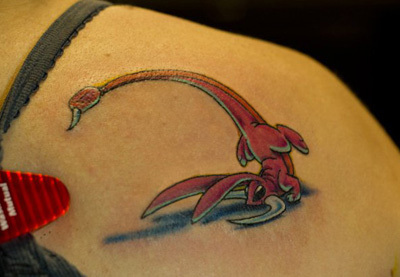 I attached some pics of the original and the new tattoo. Hope you like them! 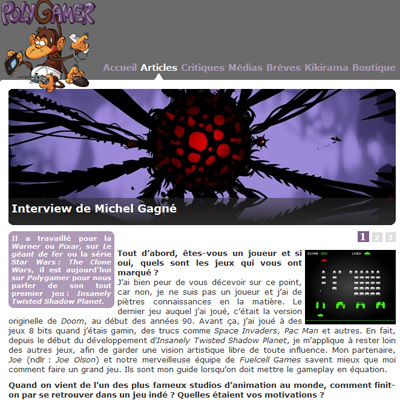 For those who can read French, here's a recent interview that was published on Polygamer. While cruising the internet, I fell upon this, a Russian translation of my book, A Search for Meaning: The Story of Rex. Not sure how good the translation is since I can't read Russian, but I'm happy to see that someone took the time to do it. I'd ordinarily use this as a way to promote the book, but unfortunately, it is out of print (although a few copies are still available on Amazon Marketplace). The original 1998 black and white version is reprinted in Parables: An Anthology, which is still available in paperback. 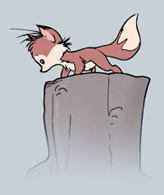 For more Rex, make sure you check out my 200-page graphic novel, The Saga of Rex, published by Image Comics, and available signed from our website. For the past three months, I've had to keep Sensology off-line due to an agreement I made concerning theatrical showings. I'm now happy to report that the film is back on-line for good! I got some great news today! My short film, Sensology, won the Chester Award in the Best Experimental/Art Film category. You can see a full list of winners here. 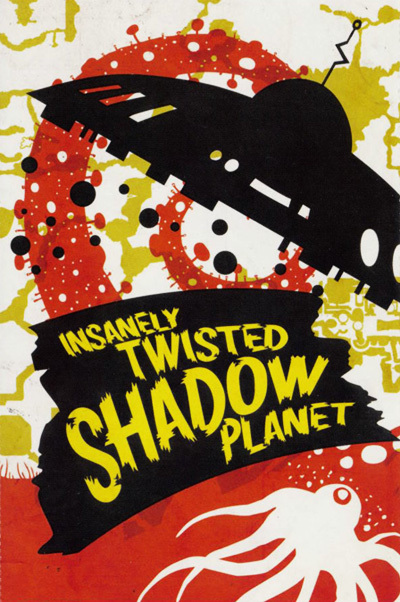 One thing I forgot to mention about PAX East last March, was the fact that the XBLA marketing department released a set of 6 limited edition postcards featuring Insanely Twisted Shadow Planet and other upcoming games. The postcards, designed to look like vintage movie posters, were quite a hit with the crowd. Only 700 copies of the set were printed so those puppies are pretty rare. Here's a look.